Directions: From Morehead at junction of US-60E & Rt. 32 (Christy Creek Road) at Rodburn, go east 10.6 miles on Rt. 32 (Christy Creek Road then Brown Ridge). Barn is on right at end of driveway which is to left of house. Barn is near the Elliott County line. 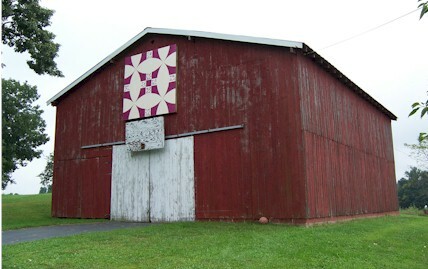 Notes: Quilt square is based on a quilt that Wilda Mays made herself about 1997. The pattern was given to her from a friend in Morgan Co., Ky. 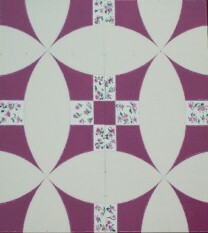 It was an old pattern that she really liked because she thought the colors blended well. It’s mainly mulberry and off-white with little pink flowers. 56 squares make up the quilt that is set up on unbleached muslin. It was tedious for Wilda to make each square in the quilt, but since she like it so well she kept working at it until the quilt was finally finished.